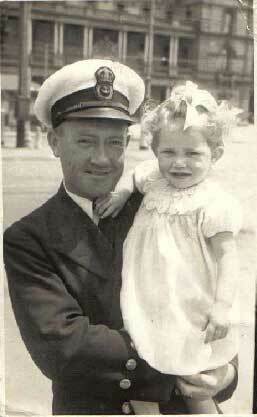 I have started researching my father who served on many ships before, during WWll and after. He was aboard the HMAS Canberra when she sunk and I remember him telling me that he was late for returning to duty and because of that he survived being killed. His name was Harry Irwin Rouse and he was an engineer, not sure what rank he was at that time. I was wondering if you had a list of personnel who was on her when she was sunk? Also I found this pic. Are these survivors of the Canberra? You wouldn't know the names of these men? As the guy on the left with the cigarette looks vaguely similar to my dad but I cannot be 100% sure. Thank you for your letter and kind words about AHOY, it is a joint effort, I do the writing and research and then across the Pacific in Atlanta Georgia, my good friend and Web Master Terry Kearns turns it all into the site that is out there for anyone who chances to log on. I do have a complete list of personnel in HMAS Canberra at the time of her sinking. 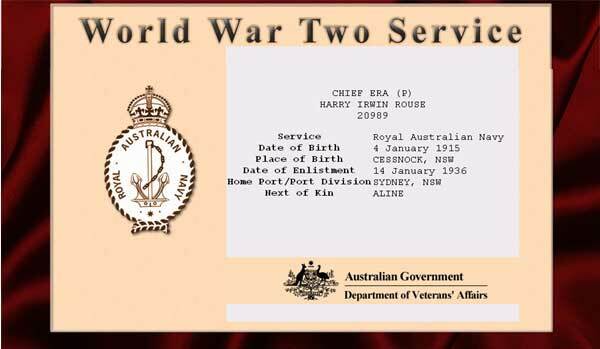 But here is your Father's Certificate of Service from the ww2roll.gov.au site. He was a Chief Engine Room Artificer, which is the highest rate one can reach in that area. I note he joined the RAN on the 14th. of January 1936, I joined the Royal Australian Naval College in January of 1936 as a 13 year old Cadet Midshipman, we would both have been at Flinders Naval Depot in January of 1936, a coincidence. I am now 85, but expect your Father might well have unfortunately died ere this. You say that your Father said he was late returning to duty, maybe he was due to be in a boiler room, and no one survived from any of the boiler rooms, the torpedo ( which in fact came from our escorting US destroyer Bagley ) that struck our starboard side in between the boiler rooms, and as I said no one survived from there. 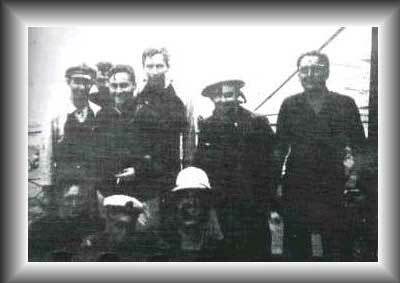 Now to the photo you sent, yes they are Canberra survivors, from the left, with a cap, Gunner Henry O'B Hodgson RAN, with the cigarette, it happens to be me, and I was a Sub Lieutenant RAN at that time, next to me, Sub Lieutenant David Medley RANVR, the others I am unable to name. Alison thank you for geting in touch.